This new gaming bar in Genting's SkyAvenue promises good drinks, specialty games and a whole lot of fun. 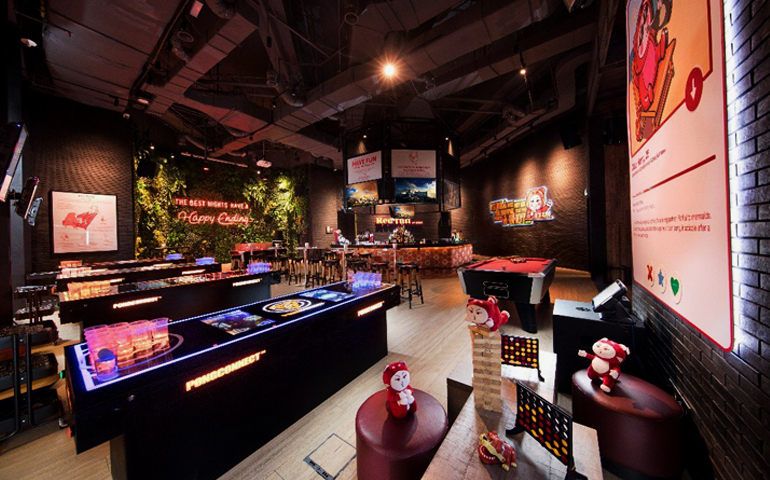 Here’s a good reason to head up to Genting Highlands for a night out – RedTail Bar by Zouk Singapore, a new gaming bar from the brand behind some of the best clubbing experiences in Asia. Located within Resorts World Genting’s SkyAvenue, the expansive RedTail provides the perfect setting for a night filled with fun and games. It can’t be called a gaming bar without games! RedTail offers plenty of specialty games like Shots & Ladders and Battle Shots (adult versions of childhood favourites), the life-sized Giant Jenga and Giant Pong (an adaptation of beer pong), Xbox E-Games alongside classic bar games like beer pong, darts and pool; look out for the limbo poles! Friendly and energetic Game Masters are readily on hand to help – whether it’s to facilitate your game, fill in for an empty spot, bring more drinks to your party, or just to hype everyone up. There are plenty of other things going on around besides games – the biggest sports matches are screened on large flat-screen TVs; live bands perform; resident DJs provide tunes to dance the night away; or you can simply take it easy on their comfortable couches and artificial turf, drink in hand. Kick back with RedTail’s range of signature cocktails, and make sure to get a shot (or three) of the Zouk-inspired house sour plum shot – a best seller at Zouk Singapore. If you need to fuel up for your next round of games, light meals and snacks like pizza and chicken wings are available from the kitchen. Whether you’re looking for a place to have pre-club drinks or you just want to get out of the city and try something different, RedTail Bar by Zouk is a good place to start.